Posts tagged with "iPad Air 2"
Coinciding with Sunday's Grammy Awards, Apple debuted a new iPad Air 2 advert with a focus on music creation. Featuring recording artist Elliphant, producer Riton, DJ The Gaslamp Killer and director So Me, the advert is a 60 second montage of the 'All or Nothing' remix being written, produced, performed and filmed on the iPad Air 2. Like most of Apple's recent adverts, they've set up a page on their website with more information about the advert and those featured in it. As noted on the page, the apps featured in this advert are GarageBand, iMPC Pro, NanoStudio, Serato Remote and Manual Camera. We've embedded the advert below, but you can also view it on Apple's website and on YouTube. My current iPad Home screen. Last week, I came across Kyle Vanhemert's story for Wired about the iPad and pondered, with a bit of fascination and surprise, his conclusion that “nobody knows what the iPad is good for anymore”. In particular, two arguments from the piece stood out to me. An iPad might still be the best option for idly surfing around the web. But if you want to look something up, the iPhone has a huge advantage: It’s right there in your pocket. Today’s iPhones are arguably better than the iPad for reading news and ebooks; they’ve got nice big screens but you can still hold them with one hand. iPhones are certainly better than iPads for taking and sharing photos, if not “enjoying” those photos, which isn’t really something people do anyway. And while iPads are indeed easier to use than Macs in terms of the software they run, as physical devices to be held and manipulated, iPads are often more awkward. MacBooks effectively have built-in kickstands. They can balance on coffee tabs, laps, stomaches. They’re light enough that it isn’t burdensome to move them between these perches. By contrast, you always have to hold a tablet. I don't want to elaborate on the particulars of specific apps and use cases, but, in broad strokes, I disagree with the article's overall assessment of iPads being better suited as “consumption” devices.1 While I see some good points in parts of the article's thesis – that Apple has struggled to explain the iPad in many ways, for instance – the underlying characterization of the iPad experience strikes me as shortsighted and repetitive. 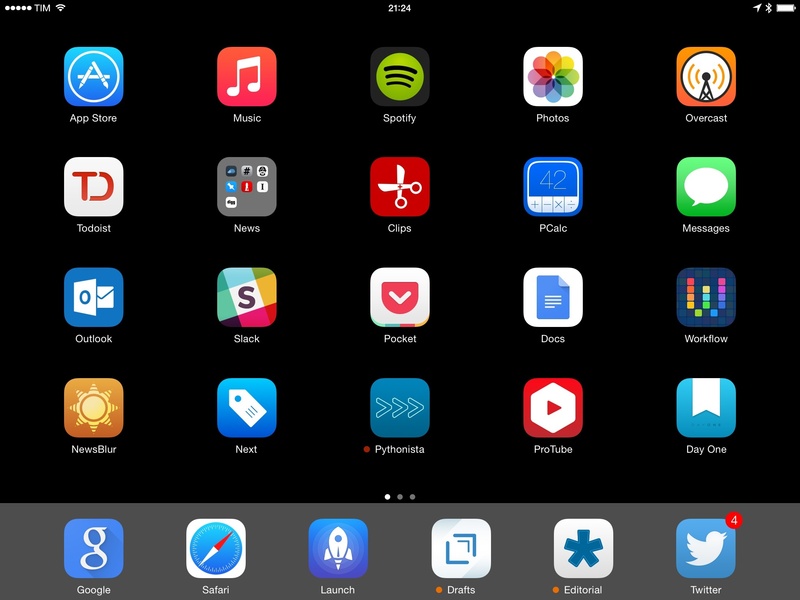 Therefore, three months after I bought an iPad Air 2 and three years into my iPad-as-a-computer experiment, I'd like to offer some thoughts on my current iPad setup and how the device has changed my computing habits. Overnight Apple published a new advert for the iPad Air 2 called 'Change'. Unlike their previous 'Your Verse' iPad adverts, which focused on how one person or small group used the iPad, this latest advert is a fast-paced montage of many different people using the iPad in many different ways. Those apps featured in the advert include iStopMotion, AutoCAD 360, Molecules, Animation Creator HD, and many more. In fact along with the advert is a new page on Apple's website that is dedicated to highlighting every single app that was featured in the advert. You can view the advert on YouTube or on Apple's website, as well as embedded below.